It's been an eventful last week since our Snetterton race, going straight from the circuit to Silverstone for a test day, meaning a 4:30am start. Ride all day with the intention of preparedness for our big news of my wild card entry being accepted for the World Superbike round at Silverstone in August! Yes, our World Championship debut will be on the first weekend in August in the FIM Cup Superstock 1000 class, the world series of the class I'm currently competing in in the UK. A very exciting prospect, and we I'll be running my number #81! A successful test over at Silverstone, with our new found front suspension settings, we headed down south to Brands Hatch for another test on Wednesday, meaning more 4:30am starts. 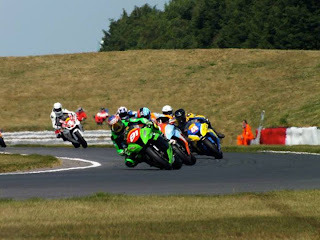 This was another success with a scorching hot English 26 deg day... Once again getting us lots of track time, fortunately with a number of top runners from my class, so I mini BSB race took place every session - good fun! After the long days on track, Mark, our team owner took his truck down the road to a friends house, that friend happened to be former Grand Prix racer of the 70's and Ducati's flagship GP winner, Paul Smart! His lovely wife, sister of Barry Sheene himself, welcomed us with afternoon tea in their garden. Paul arrived shortly after on his Ducati road bike, to give us a little peak in his garage! Two of his factory Suzuki RGs, one 750 and one 500, among a few other bikes as you'd expect a retired GP rider to have. His pride bike,a virtually priceless Ducati which he brought Ducati their first ever major GP success on, was not there. Ducati had the bike in their own racing museum in Italy, where they are trying to buy it back from him...for rather startling prices I might add! Paul is a massively nice guy, full of laughs and stories from his GP days in my homeland, bringing back memories from Roy Hesketh in Pietermaritzburg, along with names such as Alan North, Mike Grant, Rodney Gray, et al. A list of my dads friends! That was a great experience - thanks Mark! After a fun weekend in London, meeting up with some friends from home, including Thomas who will be joining us on our Tomorrowland music festival trip, and a few races over the next month. The weather was properly hot, even on South African terms! Really had fun with some of my oldest friends, and newest friends all together. I'm now ready to get back to the track, and head to Brands Hatch this weekend for our next round of the British Championship. I'll keep you all updated on the weekend, hold thumbs for us! We had a testing weekend in Scotland for our previous round of the British Superstock 1000 championship 2 weeks ago. I hadn't been to the track before so my goal was to bring it home in one piece so we could have a successful test at Snetterton the Tuesday after. We did exactly that! We arrived at Snetterton, the circuit where we had relative success last year when we qualified on the front row and finished in the lead before a safety car situation and technical problem saw me and the other two championship contenders penalised and my lead made a 7th... We knew I had the pace and enjoyed the track, we tested here before the race weekend and I really pushed the bike hard to get set up done. We arrived as prepared as we could be, only to make a season changing discovery before the main race on Sunday. I had got within 2sec of the fastest time during testing, which I thought was good, but when we entered race weekend and I couldn't go any faster, we knew we had a problem. We made some changes and still I could not better my times no matter how hard I pushed. We entered qualifying with a new set of tyres and just had to try and pull a faster lap together. I absolutely rode the wheels off the bike, desperate to turn our season around but I simply get any more from the bike. I knew the track well,I know my bike now, and that was it. The team then knew something fundamental had to be wrong with the bike, I was pushing my hardest, knew the track well and was riding as hard as I could, yet we were 2sec off... And so the digging began. Jason and Dan investigated deep into our setup and all technical aspects of handling in the bike only discover incorrect oil levels in my front suspension, but majorly incorrect! Somehow we ended up with 50mm too much oil, which is like trying to squash a full bottle of water with your hands. Its too solid to crush the bottle, my suspension is too solid to give me any feel when there's movement. After hours of decisions, advice and head scratching we came up with settings much more similar to what everyone else is running and what our suspension supplier recommended. We dialed it in and hoped it would work for the race! With all our work done, settings checked, double checked and triple checked, we set up the braai (barbeque if you're English) and had a relaxing evening in the hot sunshine eating burgers before calling it a night. The weather had been beautiful and hot all weekend, like a South African race meeting! Sunday morning was no different, waking to not a cloud in the sky, I hurried to jump on my newly changed steed for warm up . It was a completely different motorbike! It handled so differently to how I've had it all year, it required a completely different riding style, and even gearbox change! With the old settings, I rode the bike on the limit, nearly crashing every corner entry, braking late in, stopping it, and firing it out on the power. Now I had a good front suspension feel, I could ride it much smoother and faster, more like my style! I came in, having matched my qualifying time with the old tyres and not even trying to go for a fast lap. The bike was starkly different! The race came upon us, the lights went out and fortunately I got a great start, going from 31st to about 25th in turn 1! The bike felt so smooth and grippy, by lap 2 I was in 19th and on the move. As all was looking good for our top 15, I and we are so desperate for, it got spoiled by a rider behind me taking me out. He had passed me in this hairpin nearly every lap, only for me to pass him straight back again. Lap 5, I blocked the line, but he came through anyway, bumping me hard, unfortunately his front wheel hit my arm and handlebar, causing the me to crash out of the race. I was furious we had lost our chance of a good finish. The cameras were on me as I emerged from the dust, I saw my fairing screen with my number, neatly broken off in the gravel, so I brushed myself, and took a bow next to it for the cheering crowd. Little did I know this was all live on Eurosport and was even worthy of a slow-mo replay! Have a look! A bit of a disappointing end in the sense that we had a crashed bike, but a success in that we now have a bike that is working how it should be! I come away form this weekend happy and ready to stop the excuses! No more allowed! We have some more testing coming up this week, which I am very excited for! I'll let you all know how it goes once the dust settled after our hectic week of 4am starts and 10pm suppers! No one can say we're not trying hard to turn this season around! Cheers for now, some more interesting blogs coming up soon, including an afternoon beer with '70's Grand Prix legend, Paul Smart!